November II ’41 Soviet Turn. The growing strength of the Soviet army is demonstrated this turn as they inflict the largest defensive losses of the war on the Axis and nip two penetrations off trapping a panzer division and motorised division the “wrong” side of the front line. The Soviets however have no strategic reserves and Winterized troops are stuck defending Moscow with Guards and Navy troops scattered up and down the line where the defensive situation has demanded their deployment. Finland: Reinforcements are sent north to stop the slow but inexorable move east by the Germans and their Finnish partners. In the south a reinforced 10th Mech strikes at a Finish 2 division stack but only retreats them and the supporting artillery. Leningrad; To the south of the city the German penetration out of the Valdai is attacked at the neck by two armoured divisions and a massive air flotilla out of Leningrad. The defending German mech division is cadred and supporting rkt and artillery units eliminated. The armour advances to snap the door shut and reseals the front line leaving a pz division, mot divn, AT and AA unit trapped in the rough terrain to the East of the Soviet line. With more Soviet reinforcements approaching they face an uncertain future. In a second major offensive move arriving reinforcements allow an attack on the small bulge north of Kalinin and cadre two infantry divisions, straightening the line. Moscow: Troops feed into the city to reinforce the defenders and units to the east consolidate to pin the Germans tight against the city. To the south the Soviets press hard against the Panzers but cannot take them on in direct assault and the fortified pockets remain as a breakwater for the new line forming behind. Tula is determined not to go out without a fight and is reinforced. 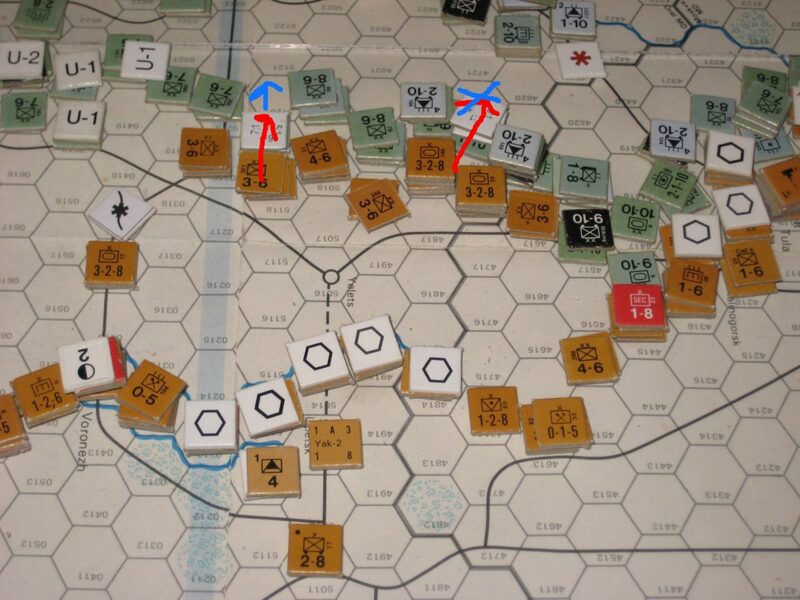 Voroshilovgrad: The Soviet attack force continues west hitting three German stacks and cadreing another infantry division. 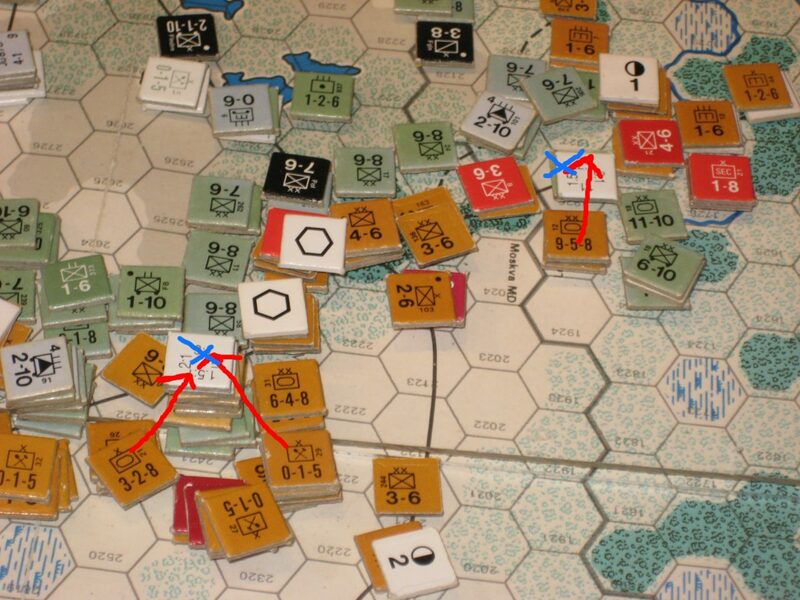 The Army is now detached from the MLR on both flanks but continues to press forward while the line is reinforced behind. Further south the fortification of the line continues and secondary reserve stacks start to form ready for any future Axis moves west. Crimea: Odessa MD spends all accumulated IRPs forming 3 divisions and ships excess troops to Sevastopol while newly arriving troops from Kerch block the peninsular west of the city.